Almost two years back mobile internet usage overtook fixed internet usage, a feat which was considered as a huge landmark in the world's digital history. Today, 75.1% of the mobile phone population in North America accesses the internet through their mobile phone. This figure is expected to grow to 85.6% by 2018! This increase in internet usage has occurred due the proliferation of apps. By 2021, the app market is projected to grow to a USD 189 Billion industry, growing at a rate of 270% approximately. At the same time, this growth in mobile app usage has also raised a lot of security questions, so much so that the next big challenge that all businesses facing is that of mobile application security. Why is Mobile Application Security Important? Mobile apps are largely considered unsecure because they need continuous internet connectivity. This is heightened by the fact that many power users try installing apps from unreliable sources thereby inviting malware and hampering the security of other apps on the phone as well. According to a report by Alcatel-Lucent's Motive Security Labs, an estimated 16 million mobile devices worldwide have been infected by malware. 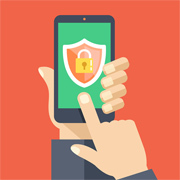 This trend therefore points to a future where mobile security is of utmost importance. As identity thefts and credit card hacks become more commonplace, certain security measures need to be implemented so as to ensure strict user confidentiality and overall security. 10. Use the Latest Cryptography Techniques: Most widely used cryptographic protocols and algorithms such as MD5 and SHA1 are insufficient as per modern security standards. Therefore it is better to use state-of-the-art encryption APIs such as 256-bit AES encryption combined with SHA-256 for hashing. As a developer, you should also invest in threat modeling, penetration testing, etc. Going into 2018 and beyond, mobile app security has to be a top concern for developers as malicious attacks are increasing and users are getting wary of installing unreliable apps. At O2I, with 20 years of experience in mobile app development, we follow mobile app security best practices and also test the app thoroughly to ensure the reliability and integrity for our clients. We believe that mobile app designing is not only about innovation and creativity, but also about offering a safe user experience. Contact us right now and see for yourself how our mobile app security protocols can make a difference to your apps overall functioning, be it for iOS, Android, or Windows.